Fabricators watch as an artificial hip joint comes together on the tray of a 3D printer. This, doctors say, is the high-tech future of joint replacement. The printer’s lone nozzle squirts plastic polymer out into the precise shape. However, in the time it takes to make a new joint, you could watch half a season of The Bachelor, or drive from New York City to eat poutine in Montreal. One company is addressing the time barrier with a new software that enables faster, and much bigger, 3D printing. 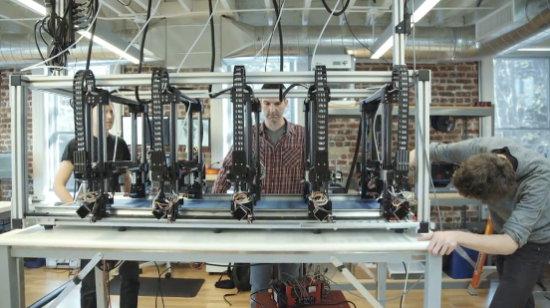 Autodesk is creating a 3D printing system, dubbed Project Escher, will be able to create large objects in one pass. Project Escher divides larger designs into smaller instructional packages. The packages are sent to groups of printheads which work in tandem to produce the finished object. This factory-line approach speeds up the often painstakingly slow printing process for large, high-resolution pieces. The customization goes further: Project Escher’s printheads are modular, making it easy to swap out different tools. For example, you could swap a printhead with a tool that removes supporting structures while the other five printheads churn out a product. This video shows just how this would happen. Printing large objects could have positive ramifications for architects: facades like this one could be fabricated in one session. Ornate wall-to-wall moldings or whole ceilings could be reproduced without interruption. 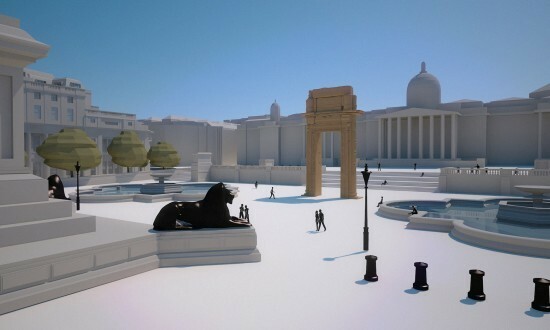 Currently, larger-scale 3D printing is currently employed by archeologists replicating ancient buildings destroyed by ISIS in the Syrian city of Palmyra. To be clear, Autodesk is not building a new printer, just the software. The printer-savvy can build their own machines to accomodate the software, mere amateurs will have to wait for the hardware to catch up.